At A&W Compressor, we feature a large inventory of air compressor parts and accessories, enabling us to provide quick solutions for Knoxville, Tennessee, area businesses that need to make modifications to their compressed air equipment. 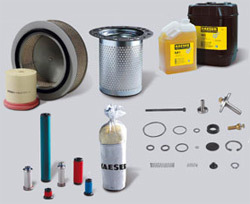 Whether you know exactly what part you need to replace in your air compressor system or aren’t sure why your air compressor isn’t performing optimally, we have the expertise and resources necessary to address all of your air compressor needs. In addition to our large parts inventory and prompt repair services, we sell new and used air compressors from the leading manufacturer Atlas Copco and provide equipment rentals to fulfill temporary needs. We also offer preventative maintenance services that help reduce the likelihood of a system failure down the road. With proper monitoring and control, A&W Compressor ensures that your compressed air system is always performing as it should. If you’re in need of air compressor parts or repair services for your business in Knoxville, TN, contact A&W Compressor today. We are happy to answer any questions you may have and can help you get your compressed air system back up and running as quickly as possible.